Technal Middle East’s stand at The Big 5 in Dubai. 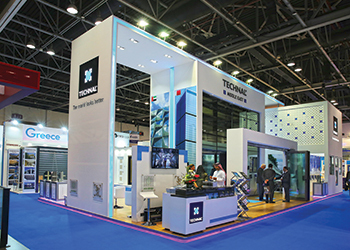 In the wake of a spate of fire incidents in high-rises in the region, Technal Middle East is promoting its new fire-proof facade and door and partition systems as safe and secure solutions. At the largest stand in Shaikh Saeed Hall at the recent Big 5 show in Dubai, UAE, aluminium systems specialist Technal Middle East showcased the engineering superiority of its latest products for various applications as well as those that address today’s need of the hour – safety and security. The French firm Technal, through its Bahrain-based regional office Technal Middle East, put the spotlight on two new products that complement each other and can be integrated to provide a complete fireproofing solution for buildings. Technal has developed a special fire-rated aluminium façade, and a fire-rated door and partition solution under the Géode and Pyroal brands, respectively. These products offer superior resistance to fire, both internally and externally, according to Hesham Kameshki, marketing and business development manager for Technal Middle East. “The recent spate of fire incidents in high-rises in the GCC has put the spotlight on the need to install quality facades that protect valuable life and property,” says Kameshki, adding that the UAE has drawn up stringent building regulations to ensure the fire resistance of building facades. Pyroal ... fire safety door. He says Technal’s fire-proof curtain-wall (CW) Géode MX-FP meets high specifications regarding fire safety. “The façade series belongs to the same family as Technal MX Géode, where the curtain-wall frames are assembled like the MX standard curtain-wall but where the mullions and transoms are filled with fire-resistant components featuring fireproof glass infill,” he explains. The Géode MX-FP is classified as EI 120 for external fire resistance at temperatures of up to 690 deg C, while it has an EI 60 rating for fire resistance at temperatures as much as 1,000 deg C. The curtain-wall has fixed 41-mm IGU (insulated glazing unit) panels – comprising 6 mm of Planitherm glass, 8-mm air space and 27 mm Vetrotech Saint Gobain glazing. The Géode MX-FP has recently been installed at the male and female students housing complex at Qatar Foundation’s Education City in Qatar. 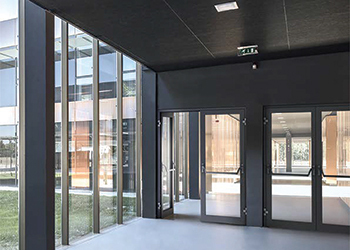 To complement the Géode MX-FP, Technal has developed the Pyroal fire safety aluminium door, which can be integrated into the façade or used on its own. This comprehensive range of glazed doors and partitions provides a protective solution for fires within buildings. The door is offered in three variants that meet E30, EI 30, EI 60 ratings in accordance with NF EN 1634 and EN 13501 standards. This allows it to offer flame resistance and guarantee a seal against combustion gases, fumes and flames, and for the EI 30 and EI 60, thermal shield properties to prevent the spread of heat, and insulation for the duration for which they have been classified. Tests have been carried out on both sides in relation to the direction of the fire. 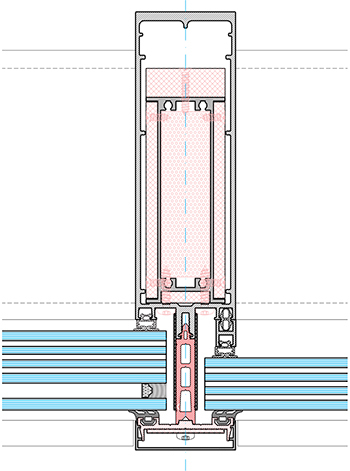 A horizontal section of the MX-FP curtain wall. These certifications allow the Pyroal fire safety door to be used in public facilities such as hospitals, retirement homes, restaurants, primary and secondary schools, theatres and leisure centres and offices; and community housing, warehouses and industrial premises, whether in new constructions or refurbishment, in compliance with regulations, says Kameshki. 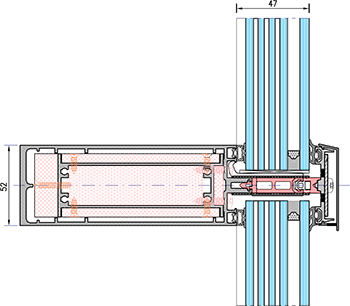 The aluminium door (with thermal break) is available as single- or two-leaf, open-in or open-out hinged versions with fixed top lights and/or fixed side lights. The module is 77 mm with an infill from 10 to 49 mm. The maximum weight per leaf is 261 kg with door leaf dimensions of up to 1.4 m by 2.85 m.
Pyroal offers a wide selection of accessories and closing mechanisms such as locks and anti-panic bars. Thresholds come with or without an EPDM (ethylene propylene diene monomer) sealing lip, with the access threshold for the disabled meeting the relevant regulations while maintaining high sealing performances. “As with all Technal systems, only the best materials and parts are used to minimise maintenance and ensure long-term performance. The aluminium profiles are extruded from construction grade 6060 alloys, and the polyamide thermal breaks from PA6-6. All seals are made from EPDM,” says Kameshki. At The Big 5 2016, in addition to the Géode MX-FP curtain-wall and the Pyroal door, Technal also unveiled other new products such as its Ambial PW high-performance folding door, the all-new Galéne GTi 140 high-performance lift-and-slide door, and the Soléal FY multi-function open-out casement windows, alongside its popular sliding window and door products. Additionally, Technal Middle East has also showcased its engineering solutions and bespoke design capabilities for large and customised projects that address the design and architecture needs of today’s complex developments. Among such innovations is its specially designed Technal MX M/F unitised façade with a unique high-performance concealed hinged door. “The MX M/F unitised façade was displayed as a full-scale large façade unit on the Technal stand, allowing visitors to witness details close up and learn all about the techniques and requirements,” he adds. Technal Middle East rounded up its Big 5 showcase with illustrations of its engineering solutions and projects such as Sky Views Towers and the twin towers of Burj Vesta located about 300 m away from Burj Khalifa - which used MX M/F unitised façade and the d3 (Dubai Design District) – as well as references in the other GCC states like Qatar and Saudi Arabia. The company, which has been serving the Middle East for more than 37 years, offers a wide range of technically advanced proprietary and bespoke products for all types of architectural aluminium façades, skylights, sunshades, windows, doors, office partitions, balustrades and blast- and bullet-proof applications.